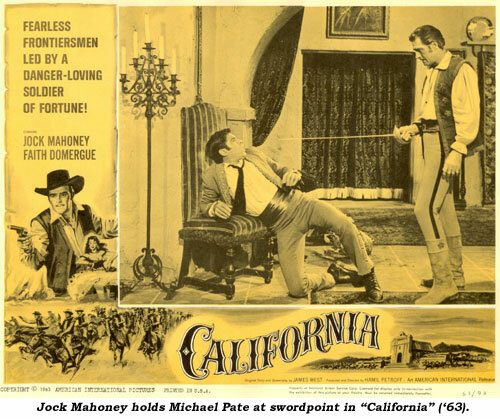 Michael Pate is an Australian who conquered the screen Wild West by playing vicious killers and bloodthirsty Indians. As a matter of fact, at one time or another Pate portrayed every true life Indian chief there was—Crazy Horse, Sitting Bull, Victorio, Quanah Parker, Geronimo—as well as a lot of fictitious ones, Strongbow, Yellow Robe, Sleeping Dog, Blue Horse, Kotana, Sankeno, Toriano, Chato, Buffalo Calf, Running Horse, among others. Pate was born February 26, 1920, in Drummoyne, a harborside suburb of Sydney, Australia. His father, Barney Pate, was a talented and well known horsebreaker, trainer and Royal Easter Show reinsman who later became a master pastry cook and baker. Schooled at home by his maternal Grandmother and his parents, Michael could read and write by the time he entered kindergarten. A lover of Western movies as a child, he thoroughly enjoyed dressing up for year end concerts as an Indian chief or a cowboy, never realizing as an adult he would continue to fulfill these childhood dreams. Pate left school at 15 to get a job because it was not affordable for his family to send him on to University. Michael got a job as a junior cost accountant for several years. A few years later he quit a job as head accountant for an electrical firm when he met an influential young producer at the Australian Broadcasting Commission who, in 1938, mentored him into a career writing and broadcasting for radio. This led to radio acting, other parts on the stage and in films in ‘38 and ‘39. He became a young star of radio shows such as the “Colgate-Palmolive Youth Show” and “Lux Radio Theater”, appeared at the Minerva Theater, the Theater Royal and various little theaters in many plays and was then cast in the epic film of the Australian Lighthorse in Mesapotamia during WWI—“40,000 Horsemen”. 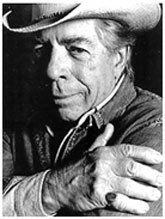 Michael also wrote for several newspapers as a book and theater critic and had short stories published in Australian magazines and anthologies and in HARPER’S BAZAAR in the U.S.
WWII interrupted his burgeoning young career and he served in the S.W.P.A. of the Australian Army’s entertainment unit in various combat areas until 1946. 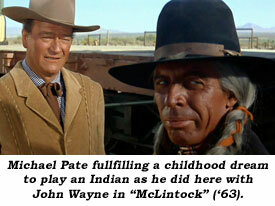 From 1946-1950 Michael starred in various radio dramas, in the theatre, and in films in Australia. He also wrote theatrical plays. In 1950 he came to the U.S. for the film version of his play “Bonaventure” which was released as “Thunder On the Hill” in 1951 by Universal. 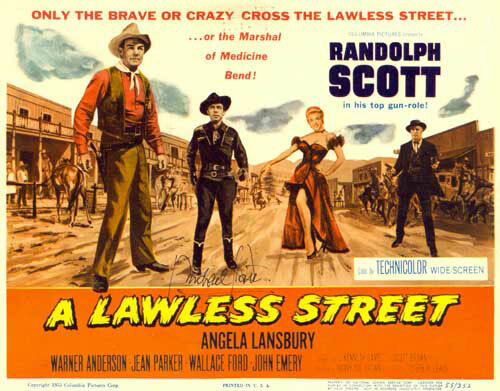 Subsequently, he began to work steadily in Hollywood (“Strange Door” ‘51, “Ten Tall Men” ‘51, “Face to Face” ‘52, “Black Castle” ‘52, “Julius Caesar” ‘53, “The Maze” ‘53) until his first western, “Hondo” (‘53 Warner Bros.), brought him into the cowboy and Indian mold he so dearly loved as a child. 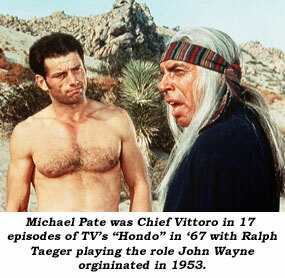 The role of Chief Vittorio instantly made Pate a recognizable western actor. On November 19, 1951, Michael married actress Felippa (“Flip”) Rock, daughter of noted Vitagraph comedian and later producer Joe Rock who, among other things, produced the first batch of silent Stan Laurel two-reelers. He also produced comedies with Chester Conklin, Slim Summerville and others. After winning an Academy Award in 1932 for “Krakatoa”, a three-reel short, he relocated to England and began Rock Studios, producing many features there. His daughter, Felippa, was in “Moss Rose” (‘47), “Kiss the Blood Off My Hands” (‘48), “Bride of the Gorilla” (‘51), “From the Terrace” (‘60), among others. While continuing to act in film and on TV, Michael began teaching acting and lectured on film acting as well as writing screenplays (“Escape from Fort Bravo”, “Rawhide” TV episode, etc). In the theatre, he played two seasons of “Medea” in L.A. and Houston. In 1968, after nearly 60 films and well over 200 TV episodes in the U.S., Michael elected to return home to write and co-produce “Age of Consent” (‘69). In Australia he acted in and produced shows in all areas, police dramas, musicals and variety series, one of which won four industry awards. He acted in over 250 TVers. For one, “Matlock Police”, he did a stint of over 192 episodes over four years, being honored with Australia’s coveted Penguin Award as Best Actor. He worked on some 15 films, also writing and directing. Never idle, Michael wrote three books between 1970-1986, including THE FILM ACTOR textbook, an illustrated children’s book and a book of his WWII experiences. In 1977, he wrote and produced “The Mango Tree” which featured his son Christopher, who, by the way, was also in a “Gunsmoke” episode, “The Whispering Tree”. In 1978 he wrote, produced and directed “Tim”, the film that launched Mel Gibson’s career and garnered Michael a Best Screenplay Award from the Australian Writer’s Guild. Son Chris was producer’s assistant for the film. In 1979 Michael was featured on Australia’s “This Is Your Life” as he continued to do theatre in Melbourne and Sydney. Michael and his son joined forces again from 1982-1984 to co-star and tour Australia on stage in “Mass Appeal”. Over the years since, Michael has done other legit plays, radio, voice-overs for TVmercials and narrations for various documentaries and corporate videos. He’s also continued to write an Australian movie column and since 1997 has contributed a bi-monthly column of his movie and TV remembrances for Boyd Magers’ WESTERN CLIPPINGS. In 1997 Michael was awarded, by his government, a medal of the Order of Australia (OAM) for services rendered to the arts and film industry. The term “gentleman and scholar” never applied more to anyone I’ve ever known than Michael Pate. He passed away September 1, 2008, at Gosford Hospital in Sydney, NSW, Australia.